It's not embeddable, so click here to check it out. Unique color footage of the 1951 Dodger Spring Training activities and personalities at Dodgertown, Vero Beach, Florida, has been added to historicdodgertown.com, it was announced today by Brady Ballard, Historic Dodgertown vice president. 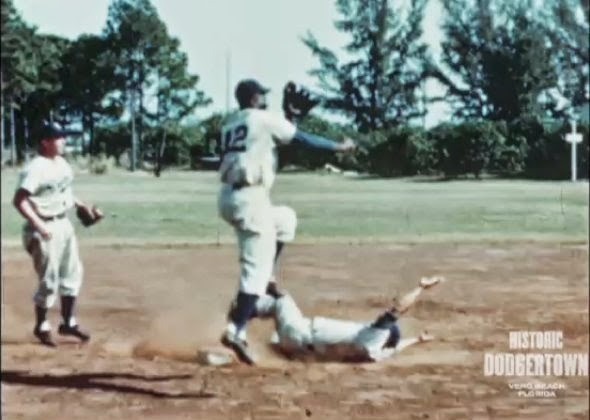 In the extraordinary footage, viewers will see first-hand and up close the Brooklyn Dodgers training on the same site that still exists today for multiple sports activities. Second baseman Robinson, who broke Major League Baseball’s color barrier playing for the Dodgers in 1947, takes swings at Field No. 2, slides in the sawdust-filled sliding pit and practices double plays with partner Reese at shortstop. Robinson wears his Dodger jersey with familiar No. 42, which was retired by Major League Baseball in 1997, with large blue letters. Campanella is shown during batting practice at Field No. 2. The Dodgers, including 1949 Rookie of the Year pitcher Don Newcombe, are shown doing calisthenics at Field No. 2. Gus Steiger covered the Brooklyn Dodgers for the Brooklyn Times, the New York Morning World, the New York Journal-American, and for more than 30 years the New York Daily Mirror. 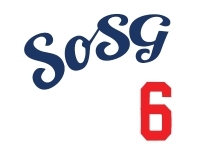 He served as president of the New York chapter of the Baseball Writers’ Association of America. And this isn't just some amateurish, shaky-cam footage. It's well-shot, in color and a lot of it is in slow-motion, allowing us to really appreciate the movements of Jackie, Pee Wee, Duke and Campy. Awesome stuff.